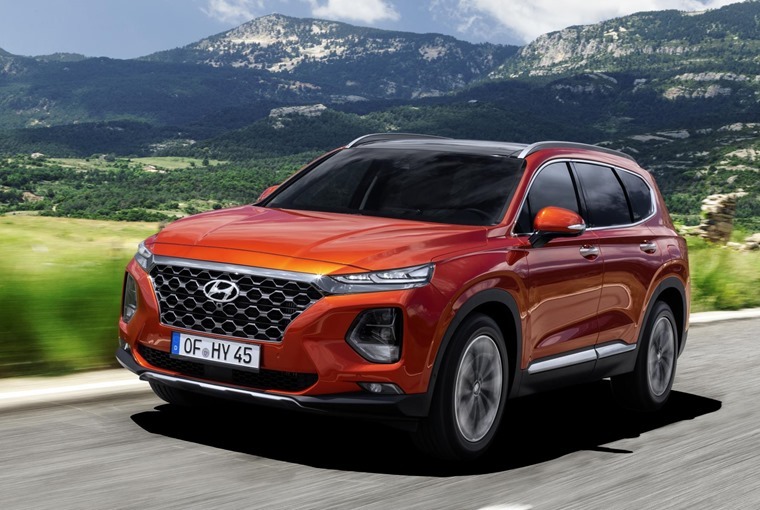 Building on the success of its predecessors, the fourth-gen Hyundai Santa Fe will be priced from £33,425 when it becomes available in September. Three trim levels will be available, including SE, Premium and Premium SE. Each is available with seven seats only and come with 17-inch alloy wheels, front and rear parking sensors, a rear view camera, climate control, heated front seats and a touchscreen featuring Apple CarPlay and Android Auto. The Premium model costs from £36,995, and adds 18-inch wheels, LED headlights, keyless entry, leather seats, an electric tailgate and an uprated eight-inch touchscreen with satellite navigation and a Krell sound system. The Premium SE sits at the top of the range, with 19-inch wheels as well as a panoramic sunroof, ventilated front seats and a driver’s head-up display. It’s offered with an automatic gearbox only and starts from £41,795. Only one engine will be available, a 2.2-litre diesel which offers 197bhp and 440nm of torque. Gearbox options include a six-speed manual and a new eight-speed automatic, with a claimed 47.1mpg regardless of the gearbox choice or wheels. 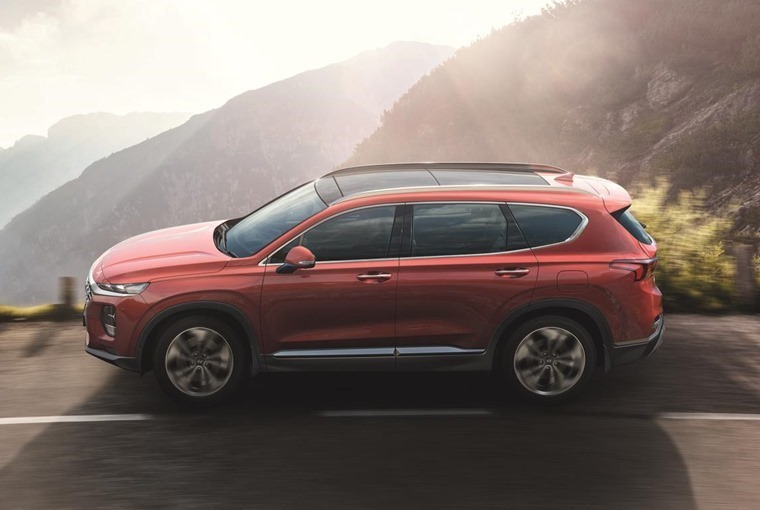 Combining Hyundai’s latest high-tech features with an intuitive spacious interior, the design of the fourth-generation Santa Fe connects with Hyundai’s SUV family design identity and as such is reminiscent of the recently released Kona crossover. It displays a modern and elegant appearance complemented by eye-catching Composite Light and Hyundai’s signature Cascading Grille. The exterior dimensions make the Santa Fe appear even more prominent. 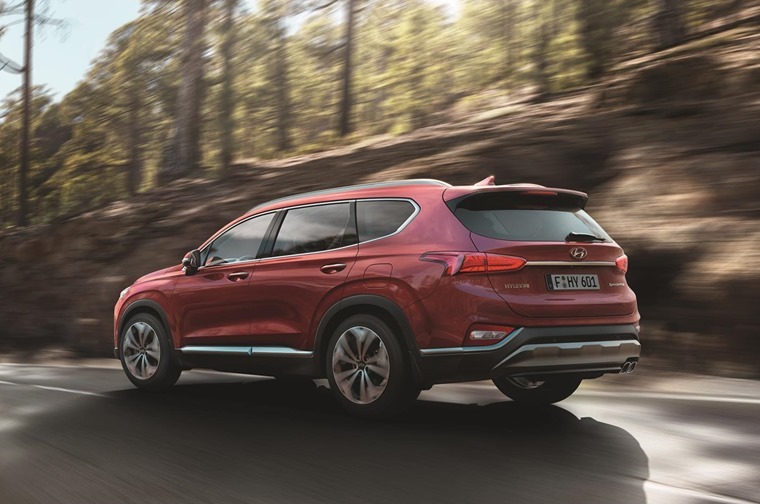 With a length of 4,770 mm, a width of 1,890 mm and a longer wheelbase of 2,765 mm, the Santa Fe has an even stronger stance on the road and provides more comfort for its seven passengers. The dynamic character of the side is enhanced by a sleek roofline and a bold side character line running from the headlights to the taillights. 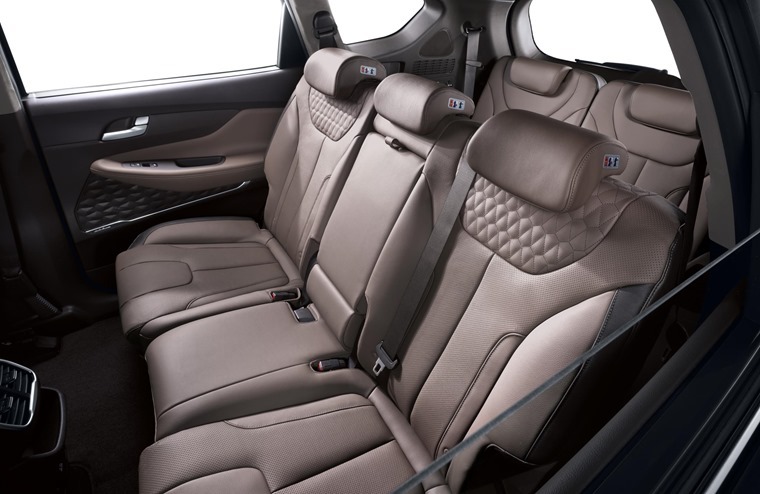 The inside combines premium quality with a roomy horizontal layout and enhanced visibility. The visibility to the rear is improved by the larger rear quarter glass, which was increased by 41% compared to the previous generation model. For the first time in a Hyundai SUV, the Santa Fe features a full head-up display to project relevant driving information on the windshield. Customers can also choose between three infotainment systems – an eight-inch infotainment system integrates all navigation, media and connectivity features and a rear-view camera, Display Audio which allows passengers to switch their smartphone’s content onto the system’s 7-inch display via Apple CarPlay and Android Auto and Standard Audio with a 5-inch monochrome TFT screen featuring radio, Bluetooth connectivity, AUX-in and USB connection. Comfort for passengers in the second- and third-row seats has been increased with legroom on the second row increased by 38mm and the sitting 18mm higher. The new one-touch folding seats ease passenger access to third-row seats. Headroom in the third row has also been improved by 22mm. 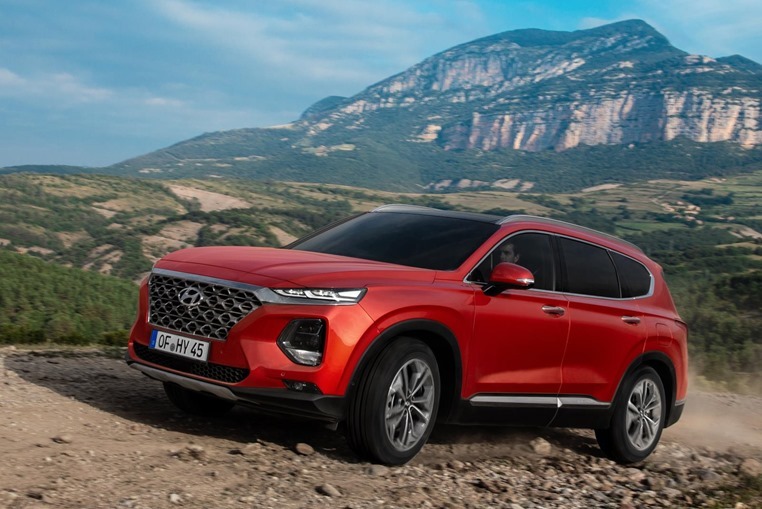 As for the drive itself, the development strategy for the new Santa Fe’s suspension and steering was to improve responsiveness and vehicle stability while also enhancing comfort and overall quietness. The suspension delivers a smoother ride by reducing the impact and vibration when driving on rough roads. The suspension has been stiffened and placed vertically to give longer travel length for more ride comfort. External vertical shock absorbers optimize responsiveness and stability while improving noise, vibration and harshness levels during driving. Road noise is reduced by reinforcing the floor panel and incorporating more materials in the carpet. The optional self-load-levelling suspension also controls the ride height regardless of the vehicle load by a self-contained damping and levelling control. The fourth-generation Santa Fe also promises to offer a best-in-class safety package and industry-first safety features such as Rear Occupant Alert to protect children, Rear Cross-Traffic Collision-Avoidance Assist, Safety Exit Assist, Forward Collision-Avoidance Assist with pedestrian detection and more. If you can’t wait for the new one, we have hundreds of lease deals on the current model and, available for less than £300 per month, it remains one of the most cost-effective seven-seat SUVs on the market.